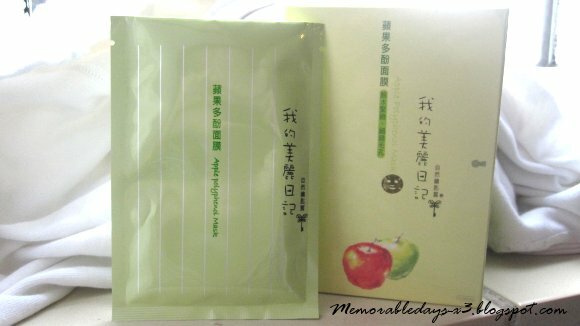 My Beauty Diary - Apple Polyphenol Sheet Mask | Memorable Days : Beauty Blog - Korean Beauty, European, American Product Reviews. Moisturizes, clarifies, smoothen, firm your face and tighten your pores. This is especially recommended for skin with enlarged pores. 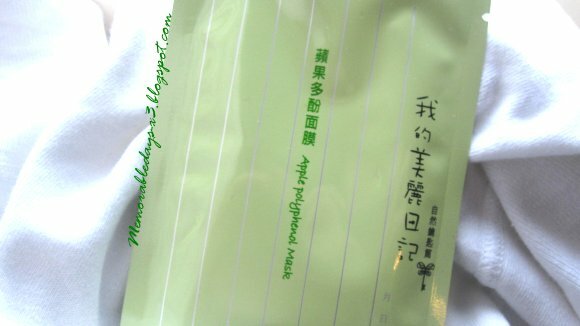 It has a nice green packaging, you only need to tear it open and unfold the sheet mask. There is an expiring date at the back of the sheet mask, so make sure to use it before that date. You can smell the apple scent directly ♥. Like all of the other sheet masks that I've tried, there is a plastic sheet folded into the sheet mask. The plastic sheet is easy to remove. 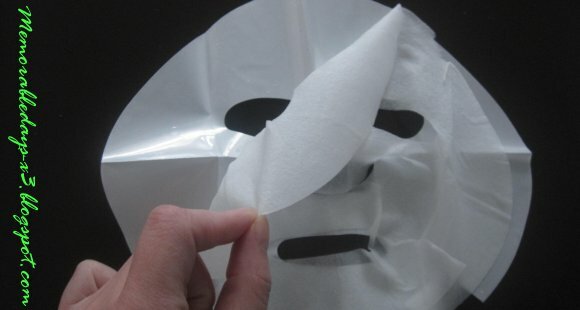 (see picture below) The texture of the mask is thin and soft. I accidentally tore the mask a little bit, while moving it (see picture on the left, woops). The cut isn't too big. The mask doesn't cover the eyes which is a pity =(. Clean your face. Unfold the sheet mask and put it on your face for 20-30 minutes. I left it on for 45 minutes lol xD. The sheet mask felt so refreshing and it moisturized my face ^_^. When it's time you genlty massage the excess tonic on your face and wait till everything is absorbed. ♥ Repurchase? BIG BIG YES! The mask is a little bit thin, but ah well, you just need to be careful with it =P My skin felt moisturized and softer after applying it ^__^! I like the scent of the mask and it felt so refreshing. The mask wasn't over saturated with moisture, so I could sit upright and make my homework while having this mask on and it didn't drip or slide off my face. 3 words: I LOVE IT =D!